Lush velvet upholstery and tuxedo style frame come together to create the Theodorus Sofa. With geometric pecan stained legs and block style tufting, you can complete any room you desire with this classic mid-century piece. Available in your choice of color to complement your decor. had my doubts, but loving it now! Thought this arms leading into the backrest was kind of unusual looking at first but now that it's here I'm really glad I went for it and didn't just pass it by because it's truly unique looking! Ordered in copen blue, I wanted to go for a more subtle shade of blue for larger pieces of furniture, this has a dusty grayish blue look to it which doesn't overpower my bright yellow accent pieces, I'm trying to up amp up the look of my living room and get a little more creative with my interior design! Absolutely no complaints or problems with my sofa or this order which is a total blessing considering my past experiences with shopping for furniture online. Just want to say how much i APPRECIATE everything being ACCURATE as far as dimensions, details and style. Plus, the customer service was more than helpful when I called and provided me with color samples to ease my mind before purchasing. Thought the design was really interesting the way the back and armrests were all equal height, especially loved the accents and of course, the velvet! i am a velvet furniture fiend ever since my velvet lounge chair purchase from last year! 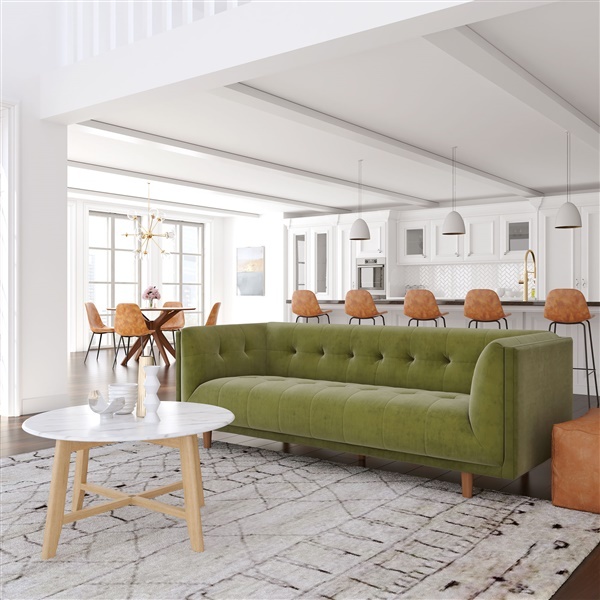 I fell in love with this sofa when I saw it on the site because it reminded me of a sofa you'd see in an old smoke parlor or poker den, the style was perfect for our family room and it really makes a great fit! It was a really smart decision going with a velvet sofa. It looks really nice under the lights in my living room and it has a smooth, almost silky like feel to the touch. I love it. the velvet upholstery is lush and feels incredible, the design is exquisite, so excited to have in my home! The velvet is so soft and the design is incredibly elegant. I feel like royalty on it! I would like to ask three questions: Is the velvet made from cotton or polyester? How much does the sofa weigh? What is the maximum weight capacity it can hold? The Theodorus Sofa weighs about 140 lbs, and has a weight capacity of 750 lbs. The velvet material is made of 100% polyester. The Theodorus Velvet Sofa is shown in the Platinum finish in the last 3 thumbnail images. If you would like to see the upholstery in person, we can send a swatch to you in the mail, free of charge. To receive a swatch, you may email us with your mailing address, and we will send a swatch sample to you in the mail right away! What size is this sofa? How long/ high / deep? Thank you! The dimensions of the sofa are as follows: Width: 82", Depth: 32", Height: 30", Seat Height: 18", Seat Width: 64", Seat Depth: 23".